Our Giant Snakehead fishing tours fishing at Mae Ngat Dam near Chiang Mai in Northern Thailand allow visiting anglers on holiday in Thailand the chance to fish for Giant Snakehead amongst the scenic jungle surroundings of the stunning Mae Ngat Dam. Anglers Giant Snakehead fishing at the wild and unexplored Mae Ngat Dam in Northern Western Thailand will be collected from Chiang Mai airport or hotel by a Fishsiam representative in an air conditioned vehicle.Anglers will be transported to our site at Mae Ngat Dam some 65km’s in a Northerly direction from Chiang Mai, the journey taking 1 hour through some spectacular countryside. Mae Ngat Dam is a relatively small reservoir covering an area of approximately 80 square km’s surrounded by lush green rain forests and mountainous peaks.On arrival at this fantastic Snakehead fishing location set in Sri Lanna National Park the angler(s) will be greeted by a magnificent inland sea, festooned with sunken trees and twisted root systems.Wildlife is plentiful in Sri Lanna National Park with numerous species of exotic and rarely seen animals such as Gibbons, Wild boar and Asian Black Bears. The angler(s) will be kitted-out with all equipment necessary for the days snakehead fishing – Spinning rod, Reel, leaders and a selection of different lures.The angler(s) will be accompanied by a Fishsiam Pro-guide and will have the exclusive use of an authentic engine-powered Thai boat, captained by a highly skilled local boatman.With the vast size of the reservoir angler(s) will be required to adopt a mobile approach during the days angling. The local boatman and your guide will gently stop the boat in likely looking holding areas allowing the angler to cast close to the submerged trees and structure. Carefully teasing the lures across the surface anglers will be rewarded by explosive strikes from Giant Snakehead, Jungle Perch and various other predatory species native to Thailand. Giant Snakehad fishing Pencils, Poppers, Buzz baits and surface lures can all produce in the right conditions with anglers prepared to change tactics regularly generally getting the better results. Fly fishing at Mae Ngat Dam also produces good results to skilled fly fishermen and baitcasting techniques with multiple captures possible by anglers able to accurately cast into the right areas. Wet weather clothing is advisable in the raining season with little cover available on the boats. Fishsiam offers full day and multiple day trips in Chiang Mai with basic accommodation in authentic floating bungalows available at a minimal extra cost. Fishing for Giant Snakehead at in Sri Lanna National park in Chiang Mai is for experienced lure anglers wishing to experience the thrilling and exhilarating sport from native predatory species such as Giant Snakehead. 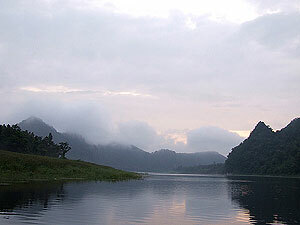 The vast size of the dam makes this venue an extremely challenging location requiring the angler(s) to constantly change their tactics.Fishsiam’s pro-guides have extremely good local knowledge of the dam and its most productive areas and ensure the angler the highest possibility of catching one of Asia’s most aggressive predatory fish the Giant Snakehead. Mae Ngat Dam Northern ThailandWhilst Snakehead fishing at Mae Ngat Dam anglers will be immersed in totally natural and beautiful surroundings surrounded by exotic animals and a plethora of flora and fauna. Giant Snakehead Fishing commences at 6am with a 3.5 hour break at 11am during the hottest part of the day. Snakehead Fishing continues from 2.30pm until 6pm when the angler is returned by air conditioned vehicle to your hotel or guest house in Chiang Mai.Anglers fishing multiple day trips will stay on site in authentic floating bungalows which offer basic accommodation (Bed/w.c). •Transfer to the Dam about 1 hour. •Lurefishing from a local longtail boat until 11.00a.m. •Lunch and a rest at a floating Restaurant in the middle of the lake. •Return to your hotel 7.00-8.00p.m. 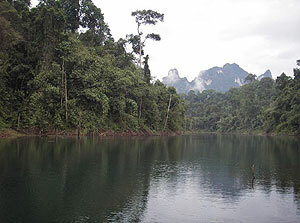 Giant snakehead Fishing at the Mae Ngat Dam is suited to experienced anglers with a sense of adventure. Our team of highly experienced guides have excellent local knowledge giving the angler the highest possibility of success.With the wild and vast nature of the venue and the constantly changing fishing conditions it is recommended that you contact us with regards to the best times to visit this amazing venue. 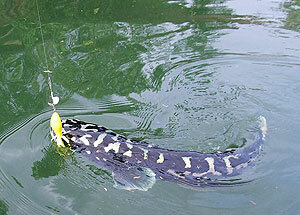 Tours to Mae Ngat Dam in Chiang Mai lure fishing for Giant Snakehead are exclusive for max. 2 anglers per trip and are available from 1th June to 15th march each year, booking has to be completed 1 month prior to arrival date in Thailand.